Banjo was founded in 2011 by Damien Patton, and is sometimes called ‘the live internet’ as it lets those who are using this app experience unfolding events in real time. They can watch breaking news as well as live events through the eyes of people who are actually there. It works by collating content from social media such as Google Plus, EyeEm, Twitter, Instagram and Facebook as well as many more, collating all geo-tagged, publicly available content and indexing it by location, content and time. It was initially intended to help app users to keep up with their friends, and in 6 months was being used by half a million people. By 2014, and following successive software upgrades, it had 6 million users. 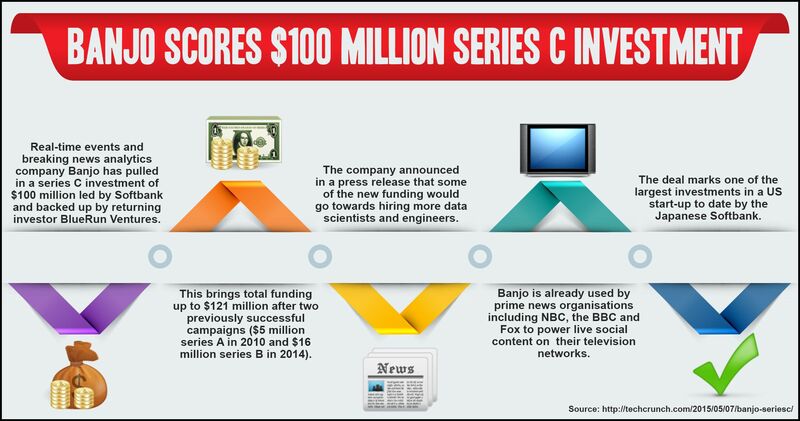 In May 2015, Banjo announced that it had successfully obtained funding of $100 million from Softbank, located in Japan. Softbank was established in 1981, has its headquarters in Tokyo and is now the 62nd largest organisation in the world. Banjo needed investment to realise its ambition of creating a ‘crystal ball’ – a way of seeing everything that is trending across the whole planet in real time. It is hoping to harness the enormous power of social media by imposing order and structure on the vast banks of accumulating information. The company has created a framework which divides the earth into 35 billion grid squares; each time something is shared publicly on social media which has been tagged with a location, it is classified and analysed. 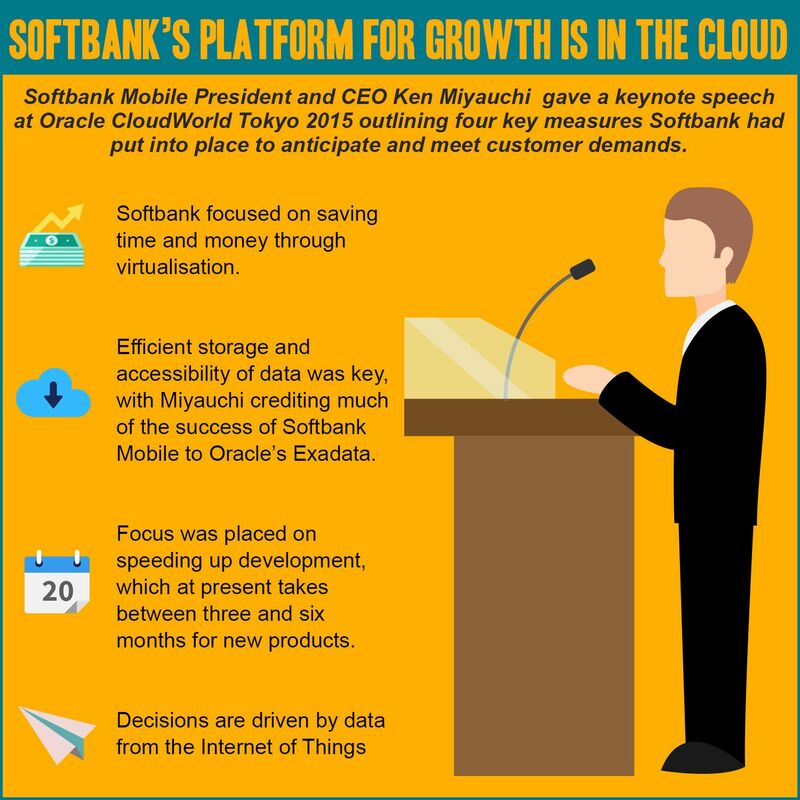 It plans to become the world’s leading real-time data platform, pushing far beyond existing boundaries. The next blog post in this series from Mukesh Valabhji will examine Softbank’s investment strategy in more detail. Japanese internet and telecommunications giant SoftBank recently enlisted the skills of renowned master samurai Isao Machii to demonstrate the speed of their new mobile service Platinum Band LTE. Machii, known as The Modern Samurai throughout Japan, demonstrates his own super-human skills with the Katana sword by slicing through several objects travelling at high speeds – an orange fired at a speed of 80km/hour which he slices neatly in half, a fried prawn fired through a tube at 130km/hour and then a glowing red ball travelling at 150kn/hour, with the video necessarily slowed down so viewers can see what is happening. 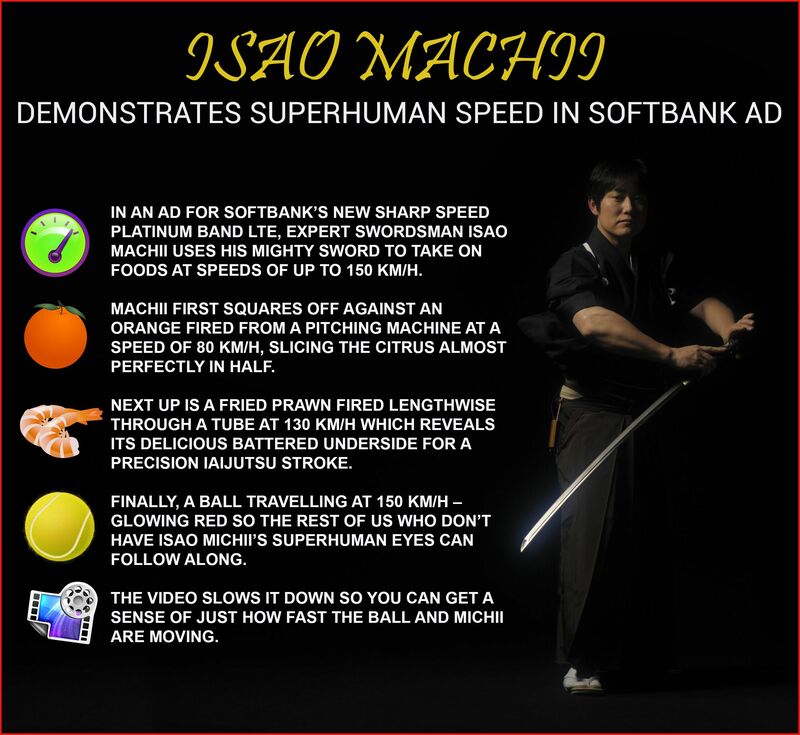 Board member of SoftBank’s PrinceVille Investments fund Mukesh Valabhji is one of many individuals highly impressed by the latest marketing campaign from SoftBank and the almost supernatural abilities of Isao Machii. The entrepreneurial Mukesh Valabhji has numerous business interests across the world and serves and has served in prominent positions on a variety of Boards throughout his career. These currently include his role on the SoftBank PrinceVille Investment board and Crimson Investments. His position with SoftBank has led Mukesh Valabhji towards further investment in start-up technology companies. These investments sit alongside his numerous property investments as founder and Chairman of Capital Management Group across commercial buildings, retail malls, hotels and resorts in a number of prime geographical locations, including the financial district of Singapore and Dubai as well as his native Seychelles, where how owns both the Capital City Building and the Intelvision Building, from where his Intelvision telecommunications, broadband and cable television operates. As such a well-known Japanese company it made sense for SoftBank to partner with an iconic Japanese figure such as Isao Machii for their Platinum Band LTE campaign. Isao Machii is one of the most renowned masters of the Iaijutsu sword style in Japan and the inventor of the Shushin-ryu Iaijutsu style. He teaches at the Kawanashi, Hyogo training venue Shushin-kan Iaido and to date holds no less than five Guinness World Records. These are: Fastest 1,000 Iaido Martial Arts Sword Cuts; Most Martial Arts Sword Cuts to One Mat; Most Sword Cuts in Three Minutes to Straw Mats (252); Fastest Tennis Ball Cut by Sword and; Fastest BB Pellet Cut by Sword. In a video which the pellet can only be seen properly when played in slow motion, Machii halves a BB gun pellet travelling at a speed of over 200km/hour! Dedicating his entire life to his craft, Machii demonstrates abilities which are beyond belief. Dr Ramani Durvasula witnessed the BB pellet decapitation and stated that this level of skill comes from processing things at a whole different sensory level. In the slowed down versions of Machii’s videos it can be seen that at the point of contact his eyes are clearly shut – Machii states that his extraordinary talent lies in being able not to watch the missile but to visualise the trajectory of the object depending on speed and environment and calculate where the object will be as it reaches his sword arc. Action happens faster than the average human can blink, hence the necessity of slowing videos down so watchers can observe what is happening. Japanese viewers may already recognise Isao Machii from other commercial roles demonstrating his impressive striking abilities including his portrayal as the ‘Fruit Ninja’ for last year’s Pillsbury Toaster Strudel advertisement. SoftBank PrinceVille Investments, of which Mukesh Valabhji serves as a board member, closed a US$250 million fund in 2013. This fund is to assist growth-stage technology companies introduce their brands and products to the fast-growing Asian market, along with expert advice and support from the existing SoftBank network of technology companies in the region. The mature mobile market in Asia along with millions of potential new customers experiencing a rise in disposable income makes the Asian market particularly appealing for start-ups and growth-stage technology businesses. Without local knowledge and funding, however, it can prove difficult for overseas-based companies to crack the market, which is where the SoftBank Capital PrinceVille fund comes in. With backers including Yahoo Japan, Alibaba Group and MediaTek Inc., the beneficiaries of the Fund are provided with both the financial and organisational backing to support entrance into the market and rapid early growth.